Paying Taxes. Paper cuts. Waiting on hold for customer service. These are some of our biggest pet peeves. But while we’re not going to get out of paying taxes, the #HoldNoMore campaign is committed to reducing the amount of time we waste on the phone listening to bad hold music. According to Hold No More, 53% of Americans say they spend 10 to 20 Minutes on hold every week, adding up to 13 hours of wasted time annually. That adds up to a whopping $108 billion a year in lost productivity from Americans waiting on hold. Worse, 48% believe that the customer service representative who ultimately answers the call isn't helpful! Meanwhile, newer methods of customer support are becoming increasingly popular among companies and customers. Forrester research says that online chat support adoption rose from 30% in 2009 to 43% in 2012. And a study from eDigitalResearch shows that messaging has the highest satisfaction levels for any customer service channel at 73%, compared with 61% for email and 44% for phone. So why are so many companies still providing substandard levels of phone-based customer support? It’s time to hold them accountable. Hold No More is launching a “Hold Face” social media march to demand that companies provide alternatives to outdated customer service practices – either stop putting us on hold or provide a more effective solution. To join the march, upload a selfie with your “hold face” and the hashtag #holdnomore to Facebook, Twitter, or Instagram and let the companies you love to hate know that you demand better. 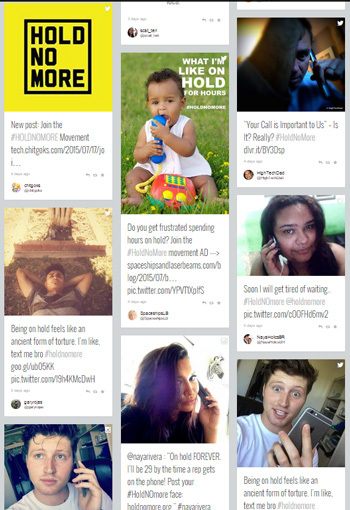 Thousands have already joined the Hold No More movement. You can check out the social media buzz on Holdnomore.org and vote for which company you think should make the dishonor roll so we can demand that they wake up and change their terrible state of customer service. Checkout this video to see how Hold No More is taking the action to the streets.